If you love something, give it away. Since 2012, #GivingTuesday has challenged individuals and businesses to practice generosity after Black Friday and Cyber Monday. Celebrated each year on the Tuesday after Thanksgiving, #GivingTuesday has become a movement that encourages and supports giving and philanthropy. In 2018, people from all over the world gave $380,000,000 to causes on #GivingTuesday (www.givingtuesday.org). 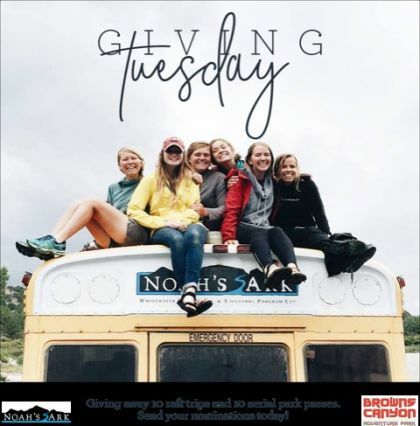 On November 27, 2018, in honor of #GivingTuesday, we asked our followers to nominate someone who would be encouraged by the gift of adventure. We would like to shine the spotlight on one of our winners, Howard and Connie Waller, and the work they are doing in their community. Here’s a bit of their story - we hope you’re as inspired as we are! Howard and Connie are the Founders/Directors of Straight Ahead Colorado, a ministry that trains volunteers to mentor youth in juvenile detention centers throughout Colorado. One of these facilities is Lookout Mountain Youth Facility in Golden, Colorado, where Howard and Connie have been volunteering for the past 20 years. Once a year, they have been allowed to take a few of the youth with the best achievements on a trip outside of the razor fences of the facility. This summer, we are excited that they will be able to bring some youth to Noah’s Ark for a trip down the river. Congratulations to all of our winners and a special shout-out to Howard and Connie! Games are one of the greatest tools a leader has to monitor and change group dynamics in the backcountry. Here are a few of our favorites. Looking for an activity that builds trust and encourages teamwork? Find out why the Browns Canyon Adventure Park is perfect for your group or family. Choosing the right Colorado rafting trip for your group can seem overwhelming, so let us help!